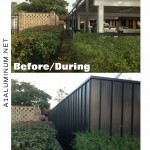 These walls were installed to further protect the cars and golf carts that are parked here from wind and blowing rain. Ms. “S” is a very nice customer. 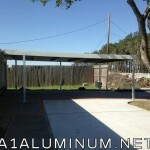 For her we installed a 20’x21′ Aluminum Carport. This will be so nice not having to unload groceries in the rain. 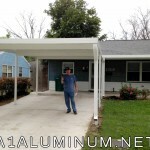 I need two of the aluminum style carports like you installed for Mary S. I am getting two new slabs by my house for these and need them covered. The ares are both 18 X 21 X 8. Unit one will connect to house on one side. While unit two will connect on one side and back. Can you give me an estimate on what they will cost? Thanks so much for replying here. 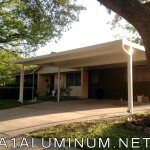 I have found your contact information and will get in touch with you today with your estimate. Have a great day! For Mr. “S” in Dickinson, we used a heavier gauge to be able to span 20′ so that we could eliminate one post and enable him to drive through the carport. 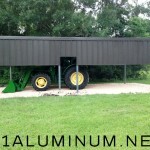 This is a 24’x18 Steel carport with PBR Panel sheets.